I need a Regency mystery plot. Do a Google search for 1820 England. Aha. Google Books has something. In 1820, Frederick Acum published a Treatise on Adulterations of Food and Culinary Poisons which tells us that lead was the most common means of preventing wine from souring. Acum writes, "A gentleman who had never in his life experienced a day's illness, and who was constantly in the habit of drinking half a bottle of Madeira wine after his dinner, was taken ill, three hours after dinner, with a severe pain in the stomach and violent bowel colic. His apothecary becoming suspicious that the wine he had drank might be the cause of the disease, ordered the bottle from which the wine had been decanted to be brought to him, with a view that he might examine the dregs, if any were left. 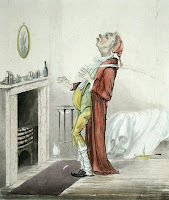 The bottle happening to slip out of the hand of the servant, disclosed a row of shot wedged forcibly into the angular bent-up circumference of it… The wine, therefore, had become contaminated with lead and arsenic, the shot being a compound of these metals, which no doubt had produced the mischief." That makes a great who done it plot. Who poisoned my villain with lead infused Port? Acum provides the final plot twist. "On the 17th of January, the passengers by the Highflyer coach, from the north, dined, as usual, at Newark. A bottle of Port wine was ordered; on tasting which, one of the passengers observed that it had an unpleasant flavour, and begged that it might be changed. The waiter took away the bottle, poured into a fresh decanter half the wine which had been objected to, and filled it up from another bottle… The half of the bottle of wine sent out of the passengers' room, was put aside for the purpose of mixing negus. In the evening, Mr. Bland, of Newark, went into the hotel, and drank a glass or two of wine and water. He returned home at his usual hour, and went to bed; in the middle of the night he was taken so ill, as to induce Mrs. Bland to send for his brother, an apothecary in the town; but before that gentleman arrived, he was dead. An inquest was held, and the jury, after the fullest enquiry, and the examination of the surgeons by whom the body was opened, returned a verdict of -- Died by Poison." Ann Tracy Marr writes award-winning paranormal Regency romances. Her books include: Thwarting Magic, Round Table Magician, and To His Mistress. For contact information and details about her series, visit her website at www.anntracymarr.com. A computer consultant in the Midwest, Marr lives with her husband, two cats, and plots that bounce off the wall. 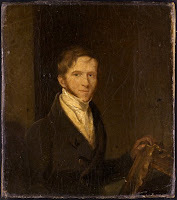 William Westall began his artistic career with a remarkable adventure. At age nineteen, after a comprehensive artistic education and a stint at the Royal Academy, he was given the post of figure and landscape artist to a great voyage of discovery. He travelled on the ship 'Investigator' under Matthew Flinders and worked with now-renowned botanist Robert Brown and botanical illustrator Ferdinand Bauer. They sailed from Madeira to Africa and ultimately to Australia, where he is honoured to this day as the first painter of Australian scenes. Much of his fame rests in his Australian work, though it is not without controversy, and he is well-known in that country. Westall's Australian work is well-documented. The National Library of Australia holds much of the art and numerous journal articles have been written about him and his fellow scientists and explorers. It is his later work in England, however, that interests me. He did not return to his homeland until 1804 due to shipwreck and detours through China and India. In 1811 he published 'Foreign Scenery' which was a compendium of the art of his travels. It did well and brought him to the attention of Rudolf Ackermann. From that point of his career on, he did a great deal of work illustrating the towns, cities, schools and universities of Great Britain. He painted the Regency world as he found it, handsome, ordered and remarkably serene. It is a fascinating catalogue of the look of the Regency. Westall's life and that of his half-brother Richard Westall is documented here by what appears to be their descendants. Westall's work is scattered in galleries around the world. He is represented only sparsely on the Internet, and not at all for his work for Ackermann and for John Murray. 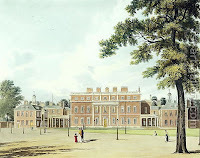 I would love to see his later paintings and drawings collected as an illustration of the Regency world. Westall, William (1830), The landscape album, or, Great Britain illustrated. I have used illustrations from 1st-art-gallery.com to illustrate this blog as copyright-free versions of his work are not much available. 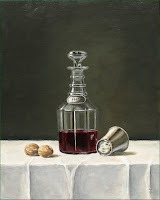 This gallery is possibly the best source on-line to view Westall's work. Next week, Ann Tracy Marr author of three Regency Fantasy books will be guest blogging with me. Please come back to visit with Ann! 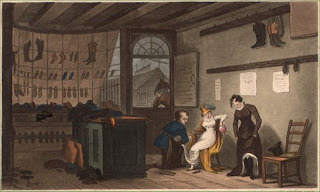 While writing my latest Regency "The Harmless Deception" (to be released in May) I had occasion to wonder how the heroine Grace Whitton heated her shop and her residential rooms above it. I realized that the heating would have to be done with stoves, and I had only a vague idea of the state of heating technology at the time. So I did a little research--not a lot because of time restraints--but enough to come up with a few interesting facts. The fireplace and open fire dominated for heating and cooking technology until the nineteenth century. But in the early 1700's cast iron stoves were being developed. The first, developed in Germany, were called five-plate stoves, but were quickly superceded by six-plate, or close, stoves. By 1790 the now-named 'box' stoves had been improved to include ten-plate models which held an oven and two hinged doors. These designs were rudimentary cook stoves, and development of them continued apace. 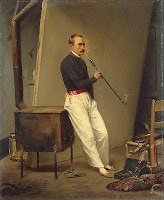 I discovered this portrait of Emile Jean Horace Vernet leaning on his (apparently cold) stove, and realized it was just such an appliance that must have heated Grace Whitton's millinery shop. Although hers would have been in much better repair! And I am certain she had a ten-plate stove above-stairs in her rooms, for heating and basic cooking. After 1820 stove technology blossomed, leading to the ornate iron monsters of mid-century. These were foreshadowed by the stoves of Abraham Buzaglo in the 1770s. One of my favourite blogs 'Two Nerdy History Girls' recently posted on his stoves; click here to learn more. The surely much-appreciated cooking ranges that revolutionized Victorian kitchens appeared by 1830 and society was in possession of a whole new technology. 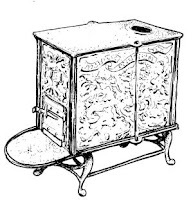 But for much of the Regency world the open fire and the simple box stove was the heating, and cooking, source available. 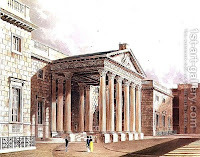 The Regency was in this, as in so many other ways, on the cusp between old and new worlds. In winter it always occurs to me to think of heat and light sources, so vital in the north where I live. I must admit I fear power outages in winter, and I'm so glad always for the return of the longer days about now. I hope your winter has been warm and bright--any stories to tell? 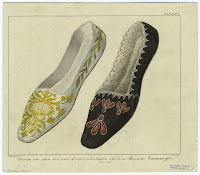 These examples from an illustration of 1829 are similar but are designated as 'Russian' shoes. 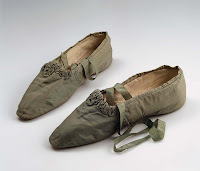 A more complex take on the simple slippers are these examples laced up the ankle with ribbons particularly made, I think, for the shorter summer gowns of the 1810s. Dancing slippers were little different, but may often have had a silk sole as well as upper, the better to slip across the ballroom floor. There are recorded cases of ladies completely shredding their dancing slippers in one evening. Most shoes of the Regency were like these slippers: silk or silk satin, with straight soles of soft leather and no designation of right or left foot. 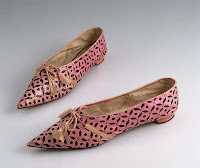 Some shoes however were of stenciled leather like these charming c. 1810 examples in pink from the Museum of Welsh Life. The Museum describes them thus: "pair of pink glace kid slippers with stylized pattern of black floral moverall; pointed toe; very low heel covered with pink leather; pink silk cord ties single pair of eyelet holes at front; narrow ribbon covers seam". 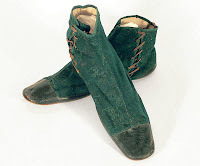 This pair of c. 1829 green silk satin shoes are from the same museum, described as "with leather soles, flattened at toes; no heel; green ribbon binding and laces; gathered satin decoration across front; left and right the same; inscribed: GODFREY Ladies Shoe Maker No 25 New Bond St London". Both of these illustrations come from the John Johnson Collection of Printed Ephemera at the Bodleian Library. I have always been fascinated by the comments about 'half-boots', and I have always had trouble visualizing them. I finally found some illustrations of original, surviving half-boots. These are available for sale at Vintage Textile and are late Regency, approaching 1830. Those on the left are of ivory linen and on the right they are of green damask with leather toes and soles. Both pairs lace on the in side of the ankle; I did see one illustration elsewhere with lacing up the front of the boot. One thing I have not found, and would love to, is an illustration of a lady's riding boot. Has anyone seen such a thing? What do your favourite shoes look like? P.S. Thanks so much to Linore Burkard for an entertaining and informative post on Princess Charlotte last week. It was a pleasure having you here, Linore!